The Shelby County Bicentennial Choir performs Beautiful Ohio during the Shelby County Bicentennial opening celebration Monday, April 1, at Sidney Middle School. 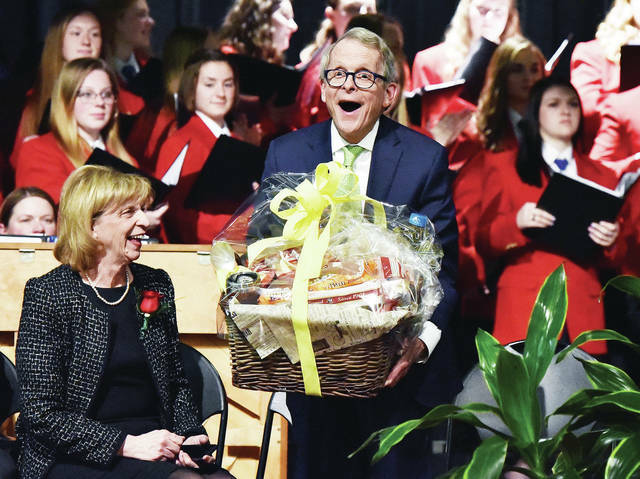 Ohio Governor Mike DeWine reacts after the Shelby County Commissioners and Sidney Mayor Mike Barhorst presented him with a basket of items made in Shelby County during the Shelby County Bicentennial opening celebration Monday, April 1. Watching is his wife, Fran DeWine. SIDNEY — “Happy Birthday Shelby County! Given your age, I’d say you are looking pretty darned good!” said Sidney Mayor Mike Barhorst during the opening ceremony Monday night at Sidney Middle School. “As hard as it is to believe, we are celebrating Shelby County’s 200th birthday on the actual date that Shelby County was formed – April 1, 1819,” said Barhorst. “While I doubt that few of you came here this evening for an in-depth history lesson, I will mention that much of what today is the great state of Ohio was once claimed by Virginia. Virginia gave up their claim to territory in Ohio in 1784. The Ohio Territory’s first county was Washington County – created in 1788 and so large that it covered about one third of the present state – and so large that subsequently 34 additional Ohio counties were formed from what was once a much larger Washington County. “Similarly, as more and more people migrated to Ohio, other counties were formed. Montgomery County was formed the year Ohio became a state, and Miami County was formed from Montgomery County just five years later in 1807,” he said. Shelby County’s 420 square miles includes some of the finest farm ground in the entire country, and Shelby County ranks eighth among Ohio’s 88 counties in agricultural production. “We also know that Shelby County ranks first among Ohio’s counties in the number of manufacturing jobs per capita,” said Barhorst. “In short, we grow things, and we make things. Years ago, plows, road graders, butter churns, pots and pans, wagons and buggies and even buggy whips were made here and shipped across the country and around the world. After introducing Shelby County Commissioner Julie Ehemann and Miami County Commissioner Gregory A. Simmons. 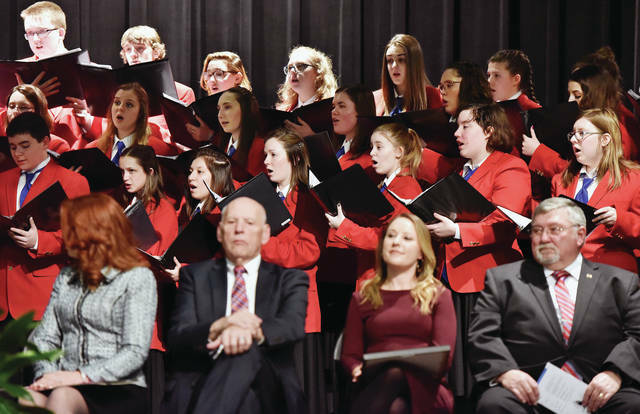 “When the county-wide high school bicentennial choir was envisioned, I asked different individuals with ties to high school vocal music which current vocal director would be best-suited to direct the choir,” said Barhorst. “Everyone I asked gave me the same answer. It’s been my experience that such a situation can be a two-edged sword. If you asked and the individual claims they are too busy – there’s no back-up plan. “Fortunately, when I called Fairlawn High School, Sonya Phillips readily agreed to direct the choir. Not only did she direct the choir, but she found the uniforms they are wearing for the first time this evening, and contacted all the schools in Shelby County to recruit the vocal musicians you’ve already heard sing the National Anthem. As the evening concluded, Barhorst thanked everyone who spoke at the celebration– the Rev. Steven Shoup and Reynolds, Gov. Mike DeWine, Sen. Matt Huffman, Reps Nino Vitale and Sustan Manchester, Miami County Commissioner Gregory Simmons, Shelby County Commissioners Julie Ehemann, Bob Guillozet and Tony Bornhorst. “Thank you not only for your participation this evening, but your hard work each and every day,” said Barhorst. “And if I may, I feel compelled to especially thank Gov. DeWine for not only his leadership but his accessibility. In the last six months, including this evening, he’s been in Sidney at public events twice. “I also want to thank the current Shelby County Commissioners for their leadership. They work well together, and they make things happen for the residents of Shelby County. We are fortunate to have them in office. “I would be remiss if I did not also thank the Shelby County Bicentennial Committee. From the time we began planning the year’s events 18 months ago, the members of the Committee have worked hard to ensure that there will be activities during the course of the year that appeal to a wide audience.” said Barhorst. SIDNEY — It’s a party that’s been 200 years in the making. The official kick off of Shelby County’s 200th birthday celebration Monday night, April 1, began a yearlong party for county residents. Ohio Gov. Mike DeWine, the keynote speaker for the event held at Sidney Middle School, said he and Fran were happy to help the county celebrate its 200th birthday. The county’s history starts with family, he said. “You have a great work ethic and you’re well situated off Interstate 75,” he said. “There’s no better manufacturing county in the state. There’s no better agricultural county in the state. “The challenges you face are the same one faced in the rest of the state,” he said citing the lack of workers to fill jobs and the opioid problem. He said he likes the partnership he sees between the schools and local businesses. Sidney Mayor and Bicentennial co-chairman Mike Barhorst presented the DeWines numerous items which are made in Shelby County, including a pie from The Spot. Shelby County Commissioner Julie Ehemann introduced the elected officials at the event. “Commemorations will occur as we honor those whose contributions have made Shelby County into what it is today,” she continued. “Discoveries will be made as we explore the beginnings of our county. Who were the people that settled here and what were their attributes that resulted in our hardworking resilient community? How did an area of swamp and wilderness become a powerhouse for manufacturing and agriculture? • That today, Shelby County has more manufacturing jobs per capita than anywhere else in Ohio. Miami County Commissioner Gregory Simmons presented the county with a proclamation celebrating the bicentennial. “It is truly a privilege and honor to be here tonight,” said Simmons, who as a child lived close to Lockington and had many friends in Shelby County. Shelby County Commissioner Bob Guillozet instructed State Rep. Susan Manchester, R-Waynesfield, 84th District, while Shelby County Commissioner Tony Bornhorst introduced Sen. Matt Huffman, R-Lima, 12th District. During his introduction of Huffman, Bornhorst noted it was Huffman and Shelby County Sheriff John Lenhart’s birthdays. Huffman said he was surprised when he was contacted about the birthday celebration thinking the party was for him. In all seriousness, Huffman said his parents lived in Sidney for a period of time after his dad returned from the Korean War. He served as a military recruiter in the county. Vitale led the group in the Pledge of Allegiance. The Rev. Steve Shoup, dean of the Roman Catholic Archdiocese of Cincinnati Sidney Deanery, offered the invocation. The Shelby County Sheriff’s Honor Guard posted and retired the colors. Local Boy Scouts assisted with greeting those in attendance. The Shelby County Bicentennial Choir sang “The Star Spangled Banner,” “Beautiful Ohio” and “God Bless America.” Pastor Rodney Reynolds, senior pastor of Solid Rock Pentescostal Church of God, gave the 222benediction.